Home / Is a Website Enough? In order for your business website to be easily accessible to your target audience you must understand and utilize the tools of technology, primarily, comprehensive advertising and responsive website design. However, not everyone can successfully build an audience on their own. With millions of websites as competition to your own, how can you stand out and get noticed? Video advertising and superior web design is the solution to a lackluster web presence. Video advertising can have a powerful effect on your company with the average internet user spending 88% more time on a website with video. Of course, the final results are dependent upon the competency of the business you hire. 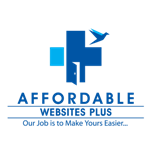 Affordable Website Plus has a proven track record of quality work and excellent customer service. Affordable Website Plus can help turn an ordinary website into one that engages your audience. Affordable Website Plus offers two highly effective options available for you to choose from. Option 1. Content is provided by you. Starting from $337. This package utilizes content that is provided by the client. Option 2. Content is provided by us. Starting at $397. This option allows you to leave content creation to Affordable Website Plus. We will create content with your business niche in mind. Don’t leave the future of your website and/or business up to fate. Instead, take the power back and reach out to your audience by using our services. We are driven by a deep desire to help your website get noticed. Contact us today to learn more about our web services, and let Affordable Website Plus transform your internet presence.